When living the RV life, one thing that you always have to think about is power. Since you aren’t always guaranteed to have an outlet to plug into, it’s necessary to bring as much energy as possible with you so that you can still use everything inside your mobile home. Fortunately, solar technology has advanced to the point where you can attach flexible panels to the roof of your RV, saving you the headache of having to bring extra batteries wherever you go. Today we’re going to look at some of the best solar panels, as well as go over how to determine your power needs, as well as how to utilize your power source as efficiently as possible. Although you probably can’t become 100% self-sufficient, it’s about as close as you can get. When comparing different solar panels for your RV, you will notice that there are mounted and portable versions. Each type provides its own benefits and drawbacks, but I would recommend both if you’re serious about utilizing solar power on the road. Let’s see what this panel can do. Although 60 watts doesn’t seem like much when you look at your different appliances, it’s perfect for charging sensitive electronics like your phone, tablet, or laptop. Considering that most of us carry these devices on us at all times, having this kind of power is useful. Another reason this panel is so reliable is that it provides 60 watts of energy consistently. Other models only have a peak rating, which means that you have to assume that you get less. That’s not the case here. Although you could mount this panel to your RV, it works so much better as a portable unit. It folds up into a case so that you can store and carry it much more easily, making it a suitable charging option wherever you are. Also, the benefit of being portable is that you can deploy it where there is the most sunlight, making it even more reliable. Although this panel isn’t necessarily suited for charging your RV batteries, it’s a highly efficient option for making sure that your devices are fully charged at all times. Coupling this panel with other mounted options on your rig can give you greater flexibility overall. Besides charging electronics, this panel isn’t made for running anything or charging a deep-cycle battery. If you’re only in the market for those kinds of panels, you will need to look elsewhere. Although this particular model is not flexible, it’s worth it to pay attention to “traditional” polycrystalline panels. These units are some of the most reliable and efficient options out there, so let’s see how it can help your RV. Because you don’t have to worry about flexibility, rigid solar panels are generally higher efficiency than bendable models. Polycrystalline is not as high-quality as monocrystalline, but it still gets the job done well. There’s a reason why flexible solar panels don’t have this kind of warranty on them - because they break down faster. ETFE film is easy to install, but it can rub off and wear out quicker. With this panel, you don’t have to worry about that for a long time. Assuming that you have room for this model on your RV, you will appreciate how reliable and efficient it is. I like that it can withstand almost all weather and that it will retain its energy output for decades. Because it uses crystals instead of film, this panel is heavier and bulkier than the other models on this list. Also, if you don’t have room (or a perfectly flat roof), then mounting it can be problematic. Next, we have another folding panel that is designed for portable deployment. However, if you’re looking for something a bit more industrial that can charge your RV batteries, this model is going to be a better option. Let’s see what it can do. Overall, when comparing different solar panels, the wattage is going to be one of the most crucial elements to consider. In this case, a peak delivery of 120 watts is more than sufficient for most charging needs. That being said, you have to realize that this number is based on maximum sunlight, so if you’re in a cloudy area or it’s winter, then you won’t be able to get the same amount of power. Fortunately, this panel comes with a meter gauge to tell you how much energy you’re producing so that you can plan accordingly. Although this is another portable solar panel, one feature that makes it a little easier to use is the fact that it comes with folding feet. This way, you can prop it up outside and collect sunlight that much easier. I don’t recommend mounting this unit. When looking at portable solar panels, this is one of the most powerful. I also like that it comes with alligator clips so that you can charge your battery directly if necessary. Because this panel delivers so much energy, it’s going to cost you for the privilege. I would recommend it only if you’re really serious about going solar on your travels. Although having a portable solar panel is good for when you need some extra juice to power your devices, mounting one to the roof is a surefire way to keep your battery bank at full capacity. Let’s see how this flexible panel from AllPowers can help you. At first glance, this number doesn’t seem all that great. However, when you consider that the best solar panels in the world can’t crack above 30%, then it puts things into perspective. The efficiency rating of a panel can make a substantial difference. The higher the number, the more reliable it is, particularly when sunlight is affected by the weather. Overall, this is one of the better options out there. Because RV roofs are not usually 100% flat, putting rigid glass panels on your rig isn’t usually feasible. Instead, you can bend this model up to 30 degrees, making it ideal for almost any RVer out there. When looking at mountable solar panels, I like that this one is lightweight yet durable. I also appreciate that it has a high-efficiency rating, meaning that you can count on more watts than average. Although the panel is durable, it’s not immune to weather damage. Compared to more rigid models, you can expect this unit to wear down faster, meaning that you’ll probably have to replace it after a few years. Another thing to pay attention to when comparing different solar panels is the type of material used in the construction. Rigid models use crystals to capture the sun's rays, whereas flexible ones like this utilize ETFE film, which is both efficient and less expensive. Although this issue is not really prevalent with most portable solar panels, it’s worth highlighting so that you’re aware of it. At night, when solar panels are not producing energy, they may be draining small amounts of electricity from your batteries. To help prevent this, the panel comes with a regulator that keeps it from drawing power when the sun goes down. If you’re looking for a solar panel that won’t take up much space and will merge fluidly to your RV’s roof, then this is going to be an excellent choice. This is one of the thinnest units you can find anywhere. Overall, this is a decent panel that is easy to mount to your RV. I like that it’s mostly weatherproof so that it will last longer, and that it can be connected easily to your battery bank. Although the thin design helps the panel stay flexible, it can also be detrimental since it can be a bit flimsy. If you’re not careful, it could break and force you to buy another one. How Much Solar Should Your RV Have? Answering this question is going to vary based on a variety of factors, but the most vital is how much energy you’ll be using in your rig. While you won’t be able to run entirely off of solar power, you can determine a sufficient amount based on the kind of appliances that you have. The first thing to do will be to conduct an energy audit of your mobile home to calculate how much electricity you use on a regular basis. Let’s go over how to do that. One of the easiest ways to figure out your energy needs for your RV is to pay attention to the appliances you have in your rig. To do that, you can look at the manual or the sticker attached to it. You’ll notice that electricity is labeled in a few different ways - watts, amps, and voltage. Let’s break down each one. If you’re drawing 10 amps from your batteries and you’re using a 120-volt system, then you can produce up to 1,200 watts. So, when you calculate the total number of watts used by your appliances and machinery in your RV, then you can determine how many amps you need as a result. For example, if you require 2,200 watts total, and you know that you’re using a 110-volt system, then you need to produce at least 20 amps at any given time. I would suggest going a little over that though just so that you have a buffer. The first question you’ll invariably ask here is “what is a charge controller?” Simply put, this is a device that prevents your batteries from getting overcharged by your solar panels. If too much power goes into the cell, then it could cause it to break down. The number of panels x wattage output, divide that by the voltage of your batteries and then add 25% for cold weather. Also, be sure to round up so that you get even more of a buffer. So, for example, let’s say that you have three panels that give you 100 watts each. That’s 300 watts, divided by a 12-volt battery (25 amps). Adding in 25% gives you 31.25, so you should round up to 32 (or higher) for your charge controller. One challenge that you’ll discover when installing solar panels onto your rig is that you have limited space to do it. The first obvious choice is the roof, but you can also install panels onto the sides of your mobile home as well. The downside of installing them on one side is that you limit the amount of solar energy you can get, but it offers more real estate, so it may be a suitable solution if you need more power. Overall, the best way to size your panel array is to determine how many of them you need to keep your batteries charged regularly. Also, keep in mind that your alternator from the engine is already charging them, so if you drive most of the time, you probably don’t need that many panels. Once you get your total number of watts necessary, then try to find panels that offer as many watts as possible. Keep in mind, however, that peak wattage is almost never going to happen, so you have to plan on only getting about 70% of that. So, for example, if you find a panel that delivers 150 peak watts, you can expect to receive 105 of them in reality. Even though you may get a little more than that, it’s always better to be conservative with your estimates. If you need 800 watts to power your batteries, then four of those panels will be ideal. However, depending on the available space on your RV, as well as the cost per panel, you may or may not be able to get all four of them. How Many Amp-Hours Is Your Battery Bank? Another thing to consider is the number of amp hours that you have total in your battery bank. Experts recommend only utilizing about half of that number to extend battery life, so keep that in mind when calculating your needs. When looking at amp hours, you’ll notice that they can vary based on the number of volts. Deep-cycle batteries (like the ones you use for appliances) will have several hundred amp hours, so let’s say that your current bank delivers 800 amp-hours. Based on the recommendation, you should only plan on using 400 of them. This estimate will help you determine how much power you have at any given time, as well as how much energy you should be using to recharge those batteries. 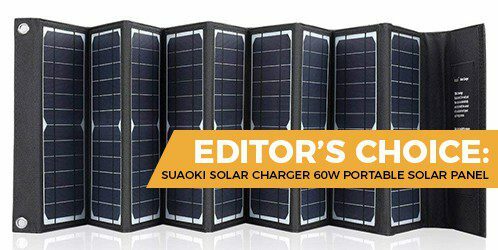 Because solar panels are all about efficiency and reliability, I highly recommend the SUAOKI model. Although it only produces 60 watts of peak power, it’s one of the most reliable and easy to use panels on the market. This panel has a high-efficiency design, so you can utilize it for a variety of needs, particularly for electronics. Having a few of these on your rig will keep you well-powered for years to come.